In addition to the city of Sacramento, RT serves much of the northern portion of Sacramento County which includes the incorporated cities of Citrus Heights and Rancho Cordova. 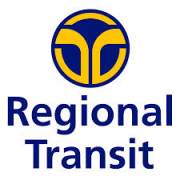 The unincorporated areas of Sacramento County under the RT service area include Arden Arcade, Carmichael, Fair Oaks, Florin, Gold River, North Highlands, Orangevale, Rio Linda and Rosemont. The system formerly provided express bus service between Downtown Sacramento and Elk Grove until the mid-2000s when that city took over bus operations under the newly created E-tran. It also provided contracted bus service to neighboring Yolo County (covering West Sacramento, Davis and Woodland); those routes and operations were later taken over by Yolo bus after its formation on January 3, 1982. In both cases, e-tran and Yolo bus have retained the RT assigned route numbers for their routes as they continue to service Downtown Sacramento.